HOUSTON (ICIS)--February contracts for US polypropylene (PP) settled 6 cents/lb ($132/tonne) lower, tracking a similar decline in monomer costs for the month. Late last week, February propylene contracts settled at a decline of 6 cents/lb from January, following several consecutive weeks of declining spot prices as well as rising inventory levels. US PP contracts are generally formula-based and are set at polymer grade propylene (PGP) values plus an adder. The decline in PP prices was welcomed by buyers, who had responded to the sharp spike in January contracts, which sent US PP contract values to a 26-month high, by reducing operating rates or looking towards imports as cost mitigation techniques. Preliminary data from the American Chemistry Council (ACC) indicates that PP production in the US and Canada was down 12% year on year and 15% month on month in January. While import volumes for January and February are likely to be higher than usual, the flow of imports is expected to slow in March as import cargoes are less attractive now that domestic prices are coming down. Offers for import homopolymer PP cargoes were last heard at around 67-68 cents/lb cost and freight (CFR) US, with some Asian producers heard to be sold out for February. With additional price declines possible in March and a six-to-eight week lead time required for product to be delivered from Asia to the US, these offers are no longer considered competitive by US buyers. Export volumes out of the US have down sharply over the past several months as higher propylene costs have pushed US PP prices to levels which made US PP exports uncompetitive compared with product from other major global regions. However, export activity may pick up in the weeks ahead now that the decline in propylene prices is bringing US PP values back into line with prices in other regions. Export prices for US homopolymer PP raffia and injection were quoted as of the week ended 16 February at 67-70 cents/lb free on board (FOB) US Gulf. 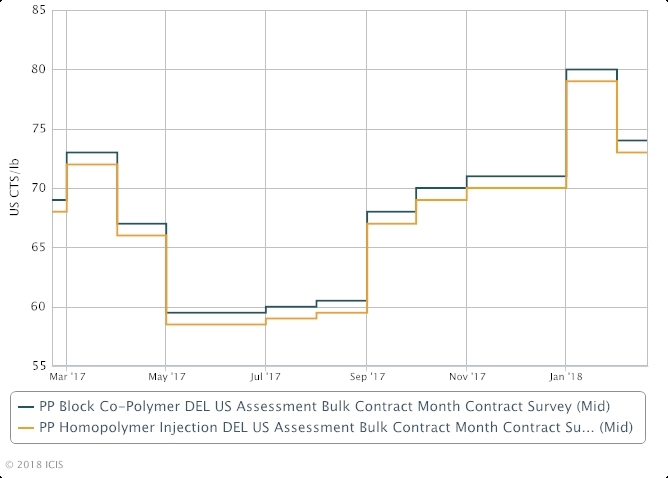 ICIS assessed February contracts for homopolymer PP injection at 71-75 cents/lb delivered in bulk US, while contracts block copolymer PP were assessed at 72-76 cents/lb with the same terms. Major US PP producers include Braskem, ExxonMobil, Formosa, INEOS, LyondellBasell and Total Petrochemicals.